The tagline to Brad Anderson’s fine cult horror film Session 9 was “Fear is a place,” a reference to the abandoned mental hospital that becomes a psychic space in much the same way as The Overlook does in The Shining. That same sentiment applies to “Spooked,” Anderson’s metaphysical Fear Itself episode, though the results are more goofy than scary. To his defense, it’s not an easy thing to pull off: Having a character’s personal demons reflected in his surroundings can either be a raw, unsettling realization of his deepest fears or the cheesiest form of armchair psychology. Tonight’s episode promised the former for maybe the first 20 minutes or so, then things went downhill fast. 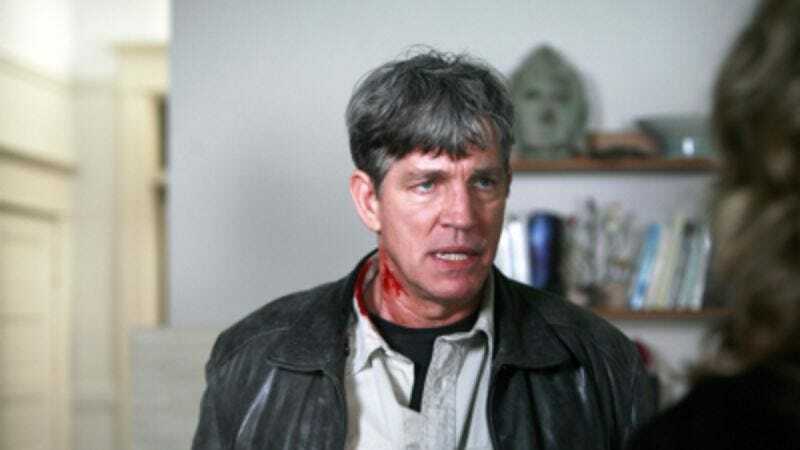 Nevertheless, after last week’s blandly proficient series opener, it was nice to have a few batshit elements in place, notably a crazily over-the-top Eric Roberts as an alcoholic private investigator running from ghosts in his past. The opening has Roberts as a cop-on-the-edge going Jack Bauer all over a suspect involved in a little boy’s abduction; his brutal tactics work to get the boy back to his family, but the suspect dies from the torture and he’s booted from the force. 15 years later, he’s doing surveillance on common P.I. adultery cases along with his partner, played by Larry Gilliard, Jr., who Wire fans will recognize as D’Angelo Barksdale. A woman hires him for what seems like a run-of-the-mill job: Her husband has been cheating on her at their home while she’s away, and she wants Roberts to catch him red-handed. The only catch is that he has to work from the dilapidated house across the street, which turns out to be haunted. Despite (or maybe in part because of) Roberts’ overacting, I was having fun with the first act of this episode, because we didn’t know precisely what all this haunted house hullabaloo was all about. Yes, the suspect Roberts killed 15 years earlier promised revenge, and yes, the audio ghosts-in-the-surveillance-machine were stirring up bits of dialogue that clearly were rooted in the past. But since nothing was made explicit yet, the episode could take advantage with some good atmosphere—though the Satanist symbols were a bit much—and a few solid shock effects. Having Roberts running around the house with his sound equipment reminded me a little of a horror twist on Blow Out, and I’d have been much happier had the audio gimmick been more central to the plot. But alas, there’s a backstory here and a hackneyed one at that. Turns out the house has the power to draw out people’s worst fears and drive them to suicidal madness. So we get some long-winded exposition about a tragic incident from Roberts’ childhood and some more exposition about how the woman who hired him figures into his past, too. And everything gets explained away, the tension quickly melts away and the melodrama gets amped up to 11. All of which leads to a howler of an ending that was telegraphed from Gilliard’s first appearance on screen. • I’m feeling a little despondent after this one, because Anderson was one of the directors I was most anticipating. At least it was livelier than the pilot—and hey, next week brings Ronny Yu. • “Why are you so bad?”… not quite “I see dead people,” was it?